Summer is coming! The birds are chirping, the temperature is rising, and all over Texas, you can hear the sounds of air conditioners being switched on. You depend on your air conditioner all summer long to keep you and your family cool and comfortable when temperatures outside are not quite so comfortable. But, what do you do when a problem arises? You schedule air conditioning repair in Austin, TX, of course! 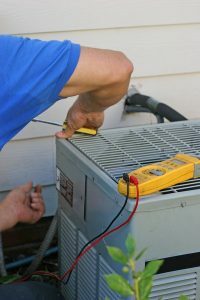 There are a number of issues your air conditioner may experience during the summer, so it is important that you’re aware of them. So below, we have outlined some of the most common air conditioning repair needs. Keep reading below to find out more! Sometimes, the issues you face with your air conditioner aren’t due to your air conditioner at all. Sometimes, an issue with your thermostat can cause your AC to malfunction. If your thermostat can’t register the temperature inside your home correctly, then your AC cannot live up to the desired temperature you’ve set for it. Your air conditioner relies on the flow of refrigerant to transfer heat from inside your home to outside. In fact, without refrigerant, your AC would be useless. So, if you’re experiencing a refrigerant leak, you will notice a lack in cooling power. Sometimes, an issue with your air conditioner might be the result of leaky ductwork. Ductwork leaks can account for up to 30% of energy loss and cause all sorts of problems for your AC. These leaks can significantly reduce performance and comfort and will definitely cause your bills to skyrocket. Short cycling is a term used to describe when your air conditioner repeatedly turns on and off without ever completing a full cooling cycle. Not only does this put a lot of stress on the system but it is also extremely inefficient. If your system is short-cycling, you can certainly expect a rise in energy costs. The compressor is one of the most important components of your air conditioning. Often, dirty coils are what cause the compressor to fail. Build-up on the coils forces your compressor to work much harder to rid the system of the excess heat it produces. Therefore, your AC must run longer in an attempt to properly cool your home. The good news is that no matter what air conditioning troubles you’re facing, an expert HVAC technician will be able to help. When you schedule your repairs, your technician will thoroughly inspect your system to pinpoint the exact source of the issue in order to repair it safely and correctly. We highly urge that you do not trust your repairs to just anyone. There are going to be plenty of amateurs willing to service your system, however, sometimes an attempt to save money can end up costing you much more in the long run. To schedule your air conditioning repairs this summer, contact the team at Roznovak’s Services, Inc.